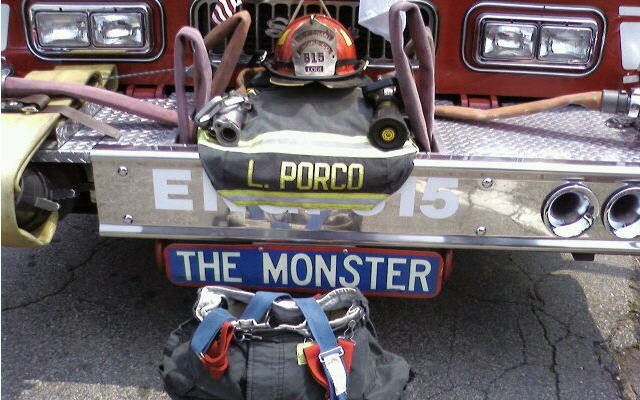 At 11:51 AM on June 20, 2007, the last and final call for Lieutenant Lance E. Porco was announced by dispatch as the Lodi Fire Department honorably saluted his firehouse. Staying with Lodi Fire Department tradition, the bay doors were raised and lowered as the member’s apparatus was backed up on the apron. 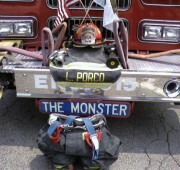 Lieutenant Lance Porco was a member of the Lodi Fire Department for 15 years, joining Hose Company 1 in April of 1992. 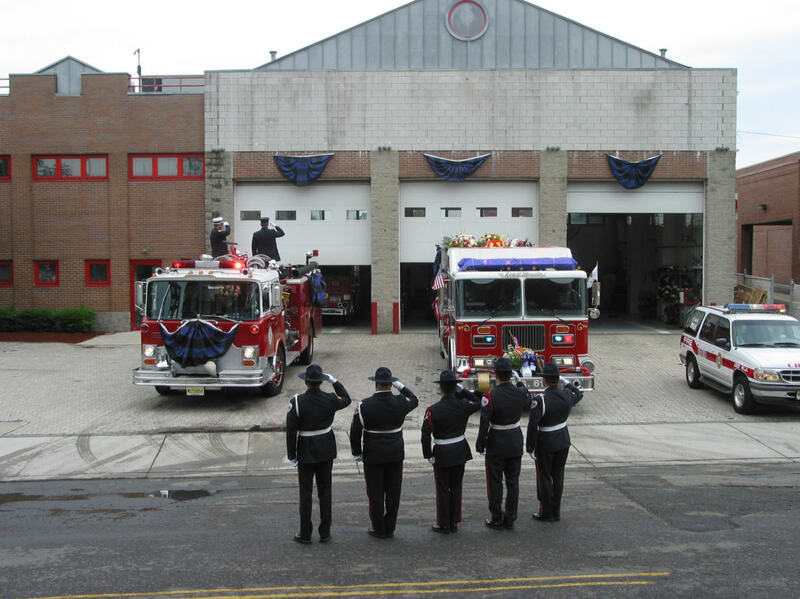 Lance was also a member of the NJ State Firemen’s Association, secretary of the Lodi Firemen’s Relief Association for the past 4 years and was an alternate for the NJ State Firemen’s Convention. 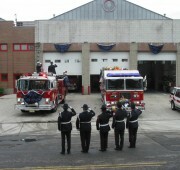 He proudly served as Captain, Lieutenant, President, Vice President and Secretary of Hose Company 1. 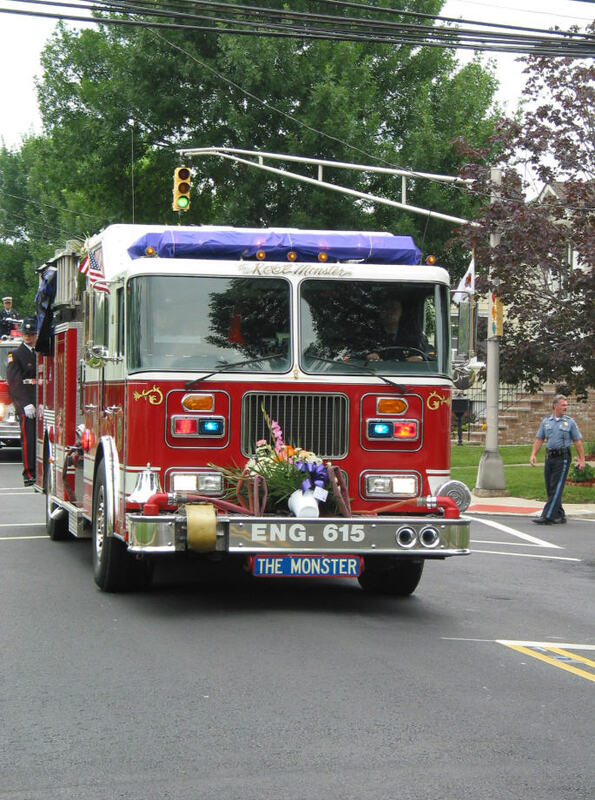 He was a Level II Fire Instructor with the NJ Division of Fire Safety and an adjunct professor with the Sussex County Community College, teaching Basic Fire Science this past semester. 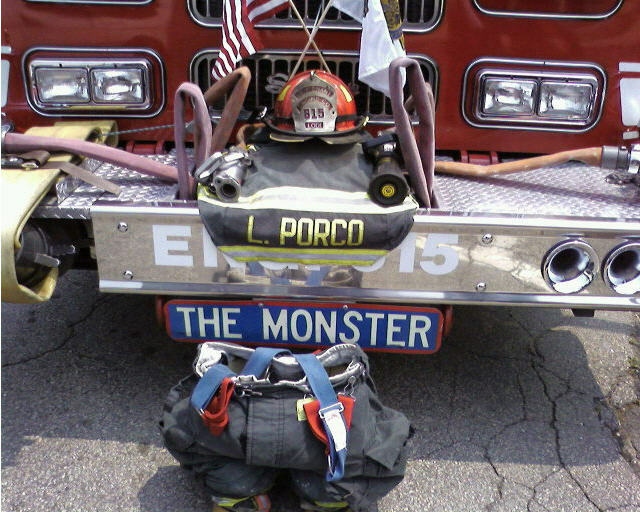 Lance served as a Lodi Fire Department Training Officer since 2006. 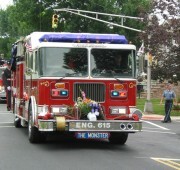 Lance was well decorated and played an instrumental part in the development and organization of the newly formed Lodi Fire Department Junior Firefighter Association. Lance was a Go-Getter. If he had an idea, he used any available resource to turn it into a reality. No matter what the idea was, how hard it would be to accomplish, or how long it would take, he dedicated whatever time and resources he had and consistently improvised, adapted, and overcame. He will be deeply missed. Our hearts and prayers are with his wife Maggie, son Jake, and his Mother, Father and Brother. Lance Porco was my professor when I was just a freshman in High School at PCTI. I will not lie, I hated him right from the start, but it was only due to my selfish teenage angst and the fact that I was very upset I got placed in a remedial English course. I was awful to him from the start and simply refused to do any work. He didn’t really know what to do with me, but he was never ever mean or angry. I’m never going to forget the day that we had “free reading” day, it was a Friday, and everyone could bring any magazine or book to read. I sat at my desk with crossed arms and refused to do anything as I always did. He sat on the desk in front of me and just stayed there quiet. I was very confused, then he turned and said, “Heeey, what’s up?” He gave me the vibe of just another high school student. I asked, “What?” Then he gave this speech, he said that he knew I had awesome writing skills, but because I had not been in the country that long I was forced to be in his class. It was protocol, and even though it was not what I wanted, it was something that had to be done. Then he told me that if I kept in this way I was going to fail and I was going to have to take the course again. I said that I wrote many letters and essays for the principal to see but they wouldn’t take me out of the class. Then I’ll never forget what he said because it was just so weird for a teacher to say, “If you want to get the man and not let the man get you, then you have to show the man and beat him at his own game.” I thought that he was just like another kid, like one of us students. Then I though, how did he get this job? His words stayed with me. I could prove them wrong. I don’t know when I started, but I started doing all of Mr. Porco’s assignments. He would hand me page after page and I couldn’t believe how easy they were. The tests were like a joke to me, it was like when they made me take Spanish I in 8th grade and I was correcting the teacher herself. I had a bad attitude problem. I remember Mr. Porco’s smiling face every time he handed me back a test with another perfect score. I felt like I could see his pride for me radiating from his face that never stopped smiling. I knew I liked him even more when one of the tests had an Alanis Morisette lyric in it. I thought, who the hell is this guy and how is he getting away with this? And then I thought, How did he get away with getting through to me? I looked forward to Mr. Porco’s class everyday. I felt like he was just another one of us kids because he never behaved like he was above us. Everyone was always happy in his class and the atmosphere was so healthy. I grew to have immense respect for him. After his class, I think I got an A. But by then I didn’t care, I knew that whatever anyone would throw at me and tell me I couldn’t do I could just do it and prove them wrong. I powered though my classes with little effort and got incredibly good grades. It was like he created a monster. I did not give up, ever. I thought, if it looks difficult, it will get simpler once you start doing it, the key is to start doing it. This is how I got through life. I heard that he volunteered to go help with the 9/11 attacks. I was so worried he would get hurt. I remember I saw him when I ran into him in the hallway. It was the remedial courses section of the school and I hadn’t been there in a long, long time. He asked me what in the world was I doing there and I had to laugh. I was just passing by but I told him that I missed him and I was so happy to see him. He told me his wife was going to give birth the next day. He said they were worried the baby would be too big and so they had to do a c-section. I told him I was worried and hoped that it will all be alright, but he just smiled and said that they had to do it because the wife was super tiny and the baby looked so big that all his friends joked that his baby will probably be born with a fire fighter’s helmet on his head. Or maybe he said that. I don’t remember. It was about 10 years ago. Close to my 21st birthday I received a text message from my friend, she told me that he died of an aneurysm. I was at work and I started to cry uncontrollably. I never got to tell him how he changed my life. My friend told me that he always asked how I was doing. My foster mother died a few months later, one day before my birthday. Every year I think of them both in the summer. I just wish I could have told him what a difference he made in my life, and to apologize for being such a nightmare freshman from hell. He was a great man.